Learn How To Optimize Your Social Media Marketing. In-depth session on how to use social media for business. Social Media Training Pune - "Time and money worth spending" -Past participant. 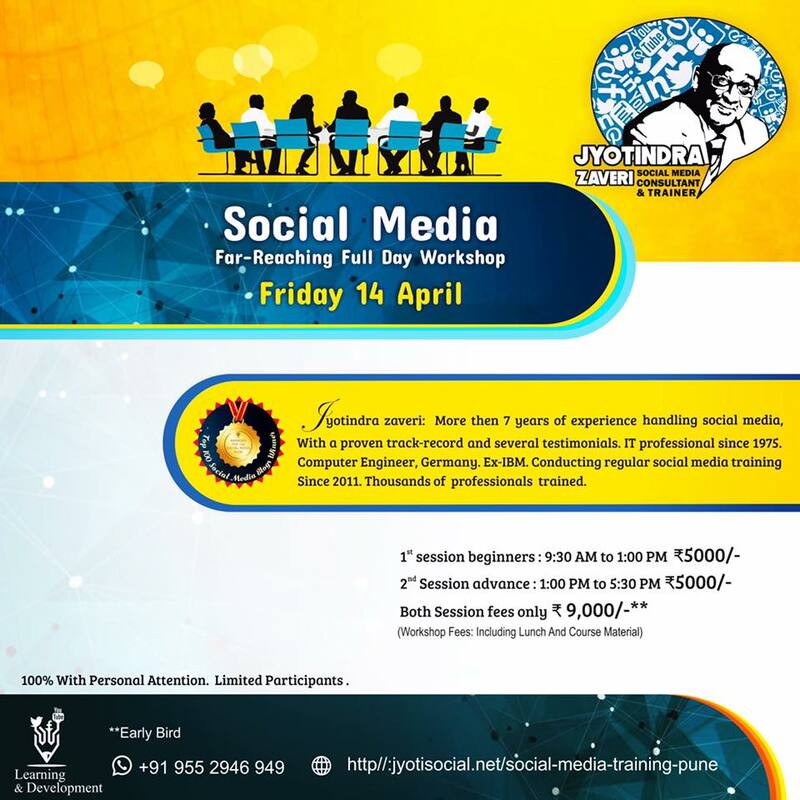 Social Media Training Pune. Widespread coverage of details of key social media platforms. Extensive practical. Want to deliver quality social media content? Register today! Social Media Marketing Personal Coaching - Only 10 participants. Limited to few participants only. Session 1: 9:30 to 1:00 pm. Followed by Lunch. For First time users. For Beginners. Learn basics of social media marketing. Session 2: 1:00 p.m. to 5:30 p.m. including lunch. For advance features. For participants who wants to ask questions and learn specific topic pertaining to his or her business. This session is for people who are already using at least two or three social media digital platforms, and would like to make it more effective. If you have not attended any of our Meetup before we recommend you to attend the first session also. Since few people are present, it is possible to give personal attention. Please bring your laptop with USB modem for hands-on exercises. WHEN? Friday, 14 April 2017. Full day 9:30 to 5:30. Including Lunch. Workshop Fees: Including Lunch and course material. ** Special discount for BNI Members. You can pay by Paytm or whatsapp Jyotindra Zaveri +91 9552946949 to get Bank Details for Social Media Training Pune. This blog post is by Jyotindra Zaveri / Jyoti.